About one-in-ten mothers with a Master’s degree or more are staying at home in order to care for their family, according to a new Pew Research Center analysis of census data. Among mothers with professional degrees, such as medical degrees, law degrees or nursing degrees, 11% are relatively affluent and are out of the workforce in order to care for their families. This is true for 9% of Master’s degree holders and 6% of mothers with a Ph.D. These so-called “opt-out moms” (roughly 10% of all highly educated mothers) make up just 1% of the nation’s 35 million mothers ages 18 to 69 who are living with their children younger than 18. 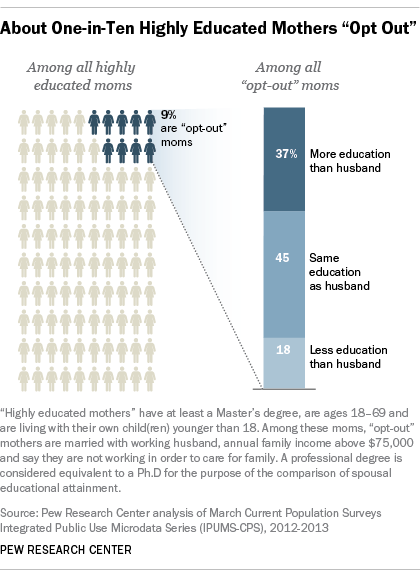 For our purposes, “opt-out moms” are mothers who have at least a Master’s degree, an annual family income of $75,000 or more; a working husband; and who state that they are out of the workforce in order to care for their family. Lisa Belkin first coined the term “opting out” in 2003, to describe highly educated, high-achieving women who seemingly chose to “opt out, ratchet back, and redefine work” after becoming mothers. Ever since then, the phenomenon of “opt-out” mothers has been a subject of much media fascination—the idea that such ambitious, professionally-successful women would put their careers aside, for the opportunity to focus exclusively on their families seemed to really strike a chord. And yet, when examining the total population of mothers who stay at home with their children, these so-called “opt-out moms” make up a very small share (4%). Most of the recent growth in stay-at-home moms has been driven by those with less education, according to a recent Pew Research Center report. Affluent, highly educated women who exit the workforce may not be “opting out”. Some suggest that they are being pushed out, due to the difficulties of balancing work and family in the U.S. Indeed, a 2009 Center for Work-Life Policy surveyof “highly qualified” women (with advanced degrees, or with high-honors undergraduate degrees), found that among those who had stepped away from their careers, fully 69% said they would not have done so if their workplace offered more flexible work arrangements. Leaving the workforce is not necessarily a permanent step. In that 2009 survey, fully 89% of those highly qualified women who had left their careers (the plurality of whom did so to care for family) reported that they did plan to return to work. Seventy percent did so, typically after about two and a half years out of the workforce. 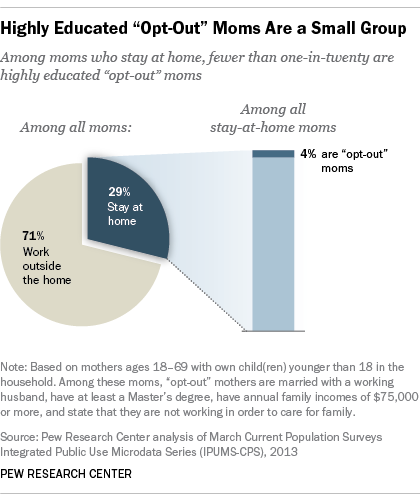 Furthermore, Pew Research Center analyses indicate that the likelihood of being a stay-at-home mother is higher for those with preschool-aged children— presumably because many moms return to work once their kids are in school. In families with these highly educated, affluent non-working moms, it may be the husbands who are bringing home the bacon, but in 37% of the cases, it is the stay-at-home wives who actually have a higher level of education. In 45% of these families, the spouses have equal educational attainment, and in about 18% of the cases, the husbands have more education than their wives. An estimate using a slightly different methodology suggests that the share of all U.S. married couples where the wife has more education than the husband is about 21%. Looking at these elite stay-at-home moms a bit differently—fully 69% identify as white. A disproportionate share (19%) is Asian, while 7% are Hispanic, and 3% are black. They tend to be a bit older than other moms; about eight-in-ten are ages 35 to 69. Their median annual family income is well over $100,000. While a relatively small share of all mothers has a Master’s degree or more, the educational attainment of all mothers has been growing steadily in recent decades. This trend has been driven by both the increasing educational levels of all women, and the fact that fertility rates for the college-educated have not fallen as much as rates for the less educated.